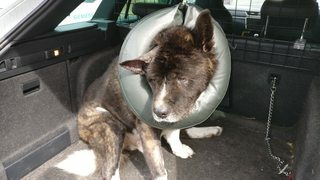 Neko had his checkup at the vet's today as it's been a week since the op on his ear. 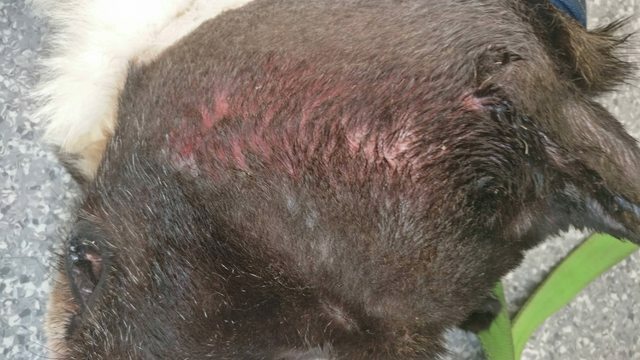 I discovered on Tuesday that he had worked out how to position himself so that he could get his hind leg around the edge of the buster collar and scratch at the ear, this meant that he managed to pull some of the sutures out and also the drain tube. The poor boy had a lot of discharge caked onto his face and ear, while I am 100% confident in dealing with large dogs part of that confidence comes from knowing where limits are - there is no way I was going to risk trying to clean around an area that was very sensitive and sore while he was not sedated, I am pretty sure he wouldn't bite me properly but I have seen the size of his teeth and the power of the jaw. I like having five fingers. Come to that I quite like having two arms. As a result, part of the trip today was to give him a proper clean up, this is what we found when we took the collar off, fair warning this is not a pretty picture. His skin is very sore from being cleaned up and from the caked on gunk, however it must still feel a lot better than it did before. 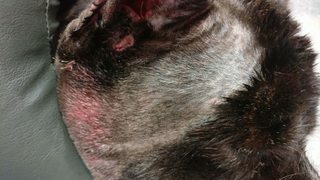 After the cleanup the vet had a proper look at his ear and decided that the best course of action would be to just remove the drain and allow the skin to knit back together naturally. The great news is that there is no sign of any infection in the ear itself, so once the incision has healed up he should be a happy Neko. We've also swapped his buster collar, which he hated and was actually trapping more gunk near the incision, for an inflatable one. Although this makes him look slightly silly, it is much more pleasant for him! 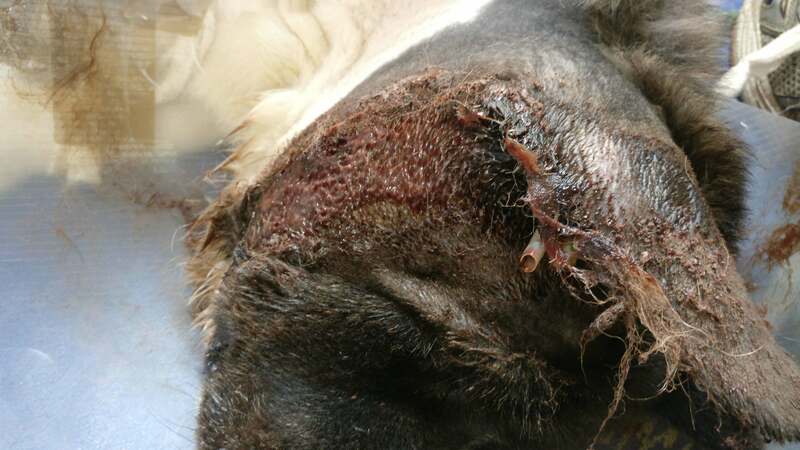 This meant that his ear and jowl could be cleaned up, as the incision is still slightly weeping. He's also got a touch of wet eczema on his check. He has been letting me carefully clean it with a very diluted baby shampoo and warm water this week, but this was still leaving some residue on the skin. What is very good news is that the wound continues to heal nicely and Neko is very clearly feeling much better in himself already, he's had a little bit more playfulness about him the last few days. So although it's a slow recovery, progress is still being made and it's great to see how this is reflected in his general level of happiness. Bless him he must have been in such pain before ....Thank you for taking such good care of him ..
Last week Neko had all of the remaining sutures taken out by the vet and although the surgery site itself is healing well there was still a significant amount of discharge coming out of his ear area, and so a swab was taken to be sent away for analysis. We returned today to have another clean out and to get the results from the swab. Unfortunately the news was not good, the lab results showed that the same infection that was present prior to the operation was also in the discharge. The infection, Pseudomonas, is one of a group of 200 different bacterial infections, some of these can become antibiotic immune very quickly. 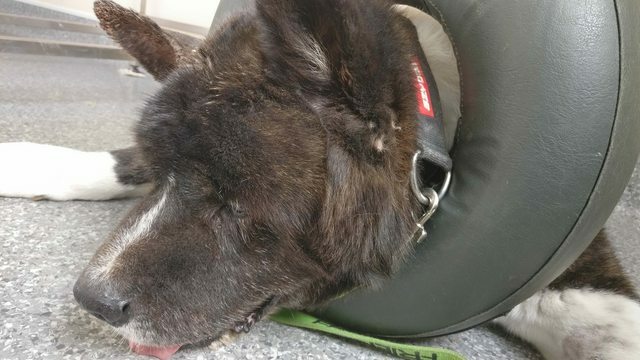 It is possible that the infection is rooted somewhere deep inside his skull and that while the operation was as successful as it could possibly be, there was a portion of it that would have been impossible to reach and that is now immune to the previous antibiotics. It's become apparent since the weekend that either the infection or the pain it is causing has had a real impact on Neko's previously gentle temperament, after talking the developments through with the vet the decision has been made to try one last very specific antibiotic that targets the Pseudomonas bacteria explicitly along with a dose of very strong painkillers. If this fails then we have to give serious thought to whether the pain is impacting him to the extent that it is affecting his quality of life. Although he has only been with me a short time, we have gone through quite a bit together and to see him still suffering after all of that is heartbreaking. 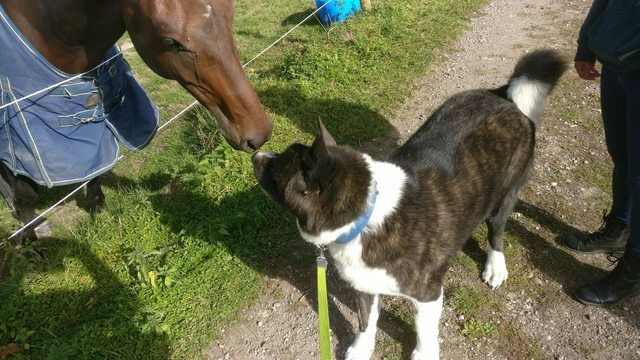 As an antidote to the doom and gloom above, here's Neko meeting something even bigger than he is - the horse was much more curious about things than he was.